Marvel's Black Panther is just a few weeks away, with the studio already dropping their Super Bowl TV spot earlier today, as the buzz keeps building and building. This was always slated to be a much different movie than Marvel has made before, with Kevin Feige confirming early on that the cast will be over 90% African-American, with a number of strong females in the mix as well. While doing press on the set last year, Chadwick Boseman made it clear that fans will get no "damsels in distress" in this movie. Here's what the actor had to say below. "Usually you have the damsel in distress. I don't think there are any damsels in distress in this movie. That doesn't exist in this movie." That statement shouldn't necessarily come as a surprise to anyone who has followed the movie closely, with the footage released thus far showcasing Chadwick Boseman's T'challa being surrounded by a number of strong women, including the all-female warriors in the Dora Milaje. 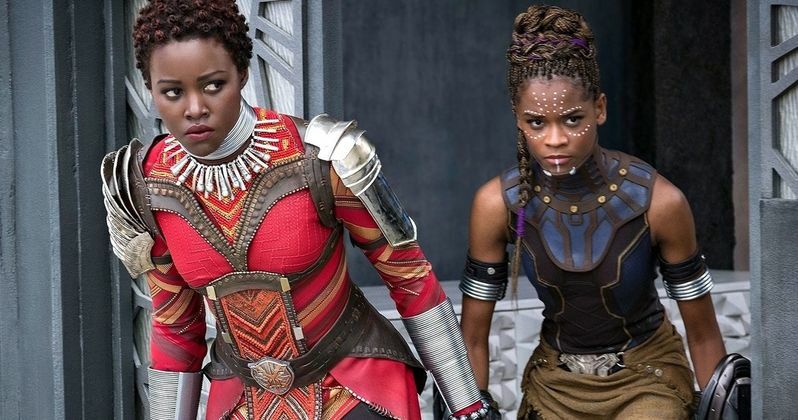 Lupita Nyong'o, who plays the Dora Milaje warrior, and T'challa's secret lover, Nakia, revealed that director Ryan Coogler and writer Joe Robert Cole have, "deepened our understanding of the role of women in Wakanda," while also letting fans know that, "the women as we meet them are departures from what we know of them in the comic books." Angela Bassett, who plays T'challa's mother Ramonda, had this to say about her character. "She's incredible to watch and, again, she's always really strong. I would say in this movie because my father is dead it gives me the opportunity to sort of look to her for wisdom and I think it shows the matriarchal African society in doing that so she's an advisor that I would go to. And it's a close relationship, it's not just like she's my mother, that she's on the side. She's not a figurehead mother." Chadwick Boseman also spoke about T'challa's sister, Shuri, played by Letitia Wright, with the actor mentioning that it is quite uncommon for a superhero to have a "little sister," adding that she had quite the positive impact on the set, stating that she, "just makes you happy as soon as you see her." Chadwick Boseman added that both Lupita Nyong'o's Nakia and Danai Gurira's Okoye are both willing to challenge T'challa, which brings out new layers in these characters. We reported earlier today that Black Panther is projected to take in $120 million on opening weekend, which would make it the biggest Marvel one-off/origin story debut in MCU history. There has also been talk from producer Nate Moore that Marvel is already eyeing a number of sequels and spin-offs, which may very well move ahead quickly if the movie meets or exceeds its expectations. Head on over to Screen Rant for their full report on Black Panther.